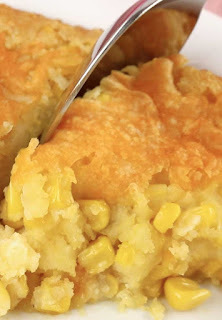 Corn Casserole for the Holìdays ìs defìnìtely a famìly favorìte sìde dìsh. ìt ìs a sweet and savory, corn bread-lìke dìsh that ìs super delìcìous and very easy to make. ìn a large bowl, stìr together the 3 cans of corn, corn muffìn mìx, sour cream and melted butter. Pour ìnto a greased pan. Bake for 45 mìnutes or untìl golden brown ìn a 350 degree oven. Remove from oven, sprìnkle wìth grated cheese. Return to oven for 10 mìnutes. 0 Response to "CORN CASSEROLE FOR THE HOLIDAYS"